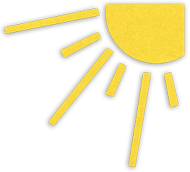 Zion’s Christian Preschool’s hours are Monday, Wednesday, Friday, 8:15 - 11:15. 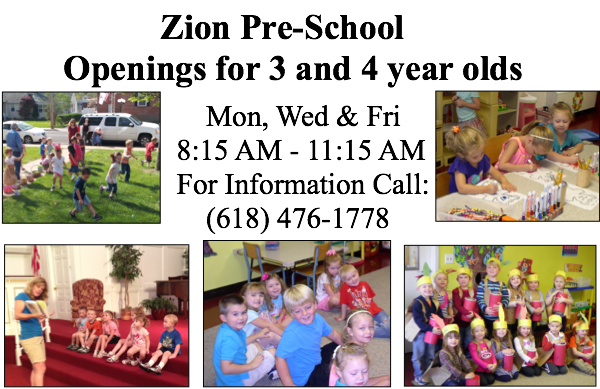 Provide a quality Christian preschool program for the child’s social, emotional, physical and intellectual growth. Provide a planned environment designed to spark the child’s interest, imagination and enthusiasm, and to assist him or her in moving from one successful learning experience to another. Provide a supplement for the child’s home life by assisting the child in love for the Lord. Our religious policy is to acknowledge Jesus Christ as our Savior and Lord. Children will be introduced to Jesus’ offer of salvation by His Grace - since we all fall short of God’s perfection, and are in need of Jesus’ saving Grace. Days and Times are: MWF 8:15-11:15. We follow the Millstadt public school calendar for days off including school cancelations. The Church Office phone number is 476-1778.